INA built, owns, and operates a Mediterranean research center in the coastal Turkish town of Bodrum, also home to the Bodrum Museum of Underwater Archaeology. The Bodrum Research Center (BRC) is headed by director Tûba Ekmekçi-Littlefield, who oversees a permanent staff of 23 people, some of whom have worked for INA for decades. In 1988 a core group of INA visionaries purchased a ten dönüm (approximately 2.5 acres or 10,000 m2) olive grove on the crest of a hill, just outside the Hellenistic city wall of ancient Halicarnassus. Four dönüm went to INA for its headquarters, and the remaining six dönüm were purchased by Tufan Turanlı, Cemal Pulak, George Bass, and Fred van Doorninck for their own homes. The four houses were built side-by-side, all in different styles by different architects, on Sualtı Sokak, which translates to “Underwater Street,” a fitting name for the home-base of INA and underwater archaeology in Turkey (see Bass’ article in INA Quarterly 21.4: 22-23). BRC Lab (Photo: INA Slide # BODD74). Turgut Cansever, a local, two-time Ağa Han award-winning architect featured in the Turkish journal Arkitekt, designed the BRC’s main buildings using his signature architectural style, blending traditional Aegean materials with contrasting features in exposed concrete. Phase one of the construction included offices, a dormitory and guest suite, communal kitchen, drafting room, dark room, and conservation facility. The main building and dormitory started being utilized in 1994, and with help from the Nason Foundation, were dedicated and officially opened on 7 July 1995. The construction of the south dormitory building was made possible by generous contributions from Marja and Ron Bural and family, Cynthia and Fred Campbell and family, Barbara and Claude Duthuit, and Jean and Jack Kelley. The north dormitory building was realized through the support of Danielle Feeney. Connecting the two is a single level corridor with a central kitchen, indoor and outdoor dining areas, restrooms, and showers. A total of 25 people can be housed in the two dormitory buildings. The top floor of the south dormitory serves as a suite for visiting researchers and VIP guess; it can accommodate two people very comfortably and includes its own kitchen, living room, and bathroom. 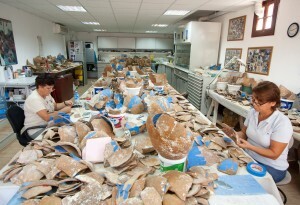 In 2013 INA acquired the residence of George and Ann Bass, which is adjacent to the Bodrum Research Center. 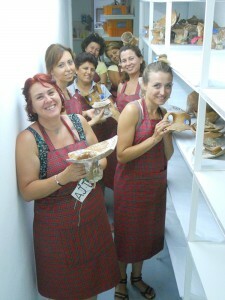 The Board of Directors feels confident that the purchase will not only expand the footprint of INA’s Bodrum Center but also ensure that the Bass’ worldwide reputation for generous hospitality lives on. 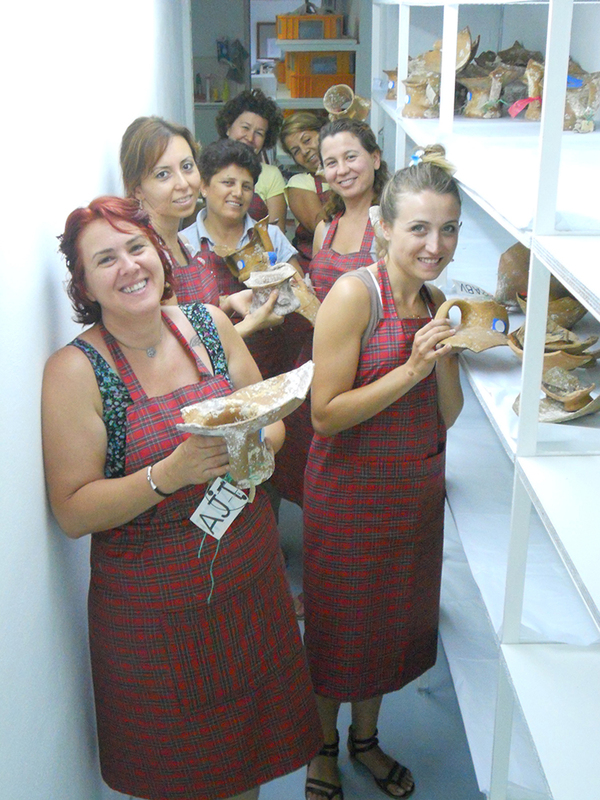 BRC Lab Girls, 2013 (Photo: Tuba Ekmekci). 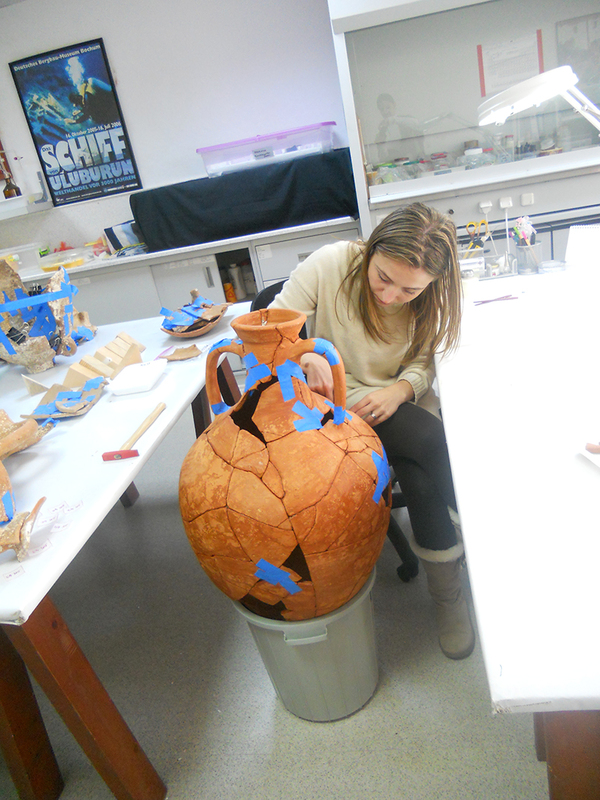 Reconstructing an amphora (Photo: INA). 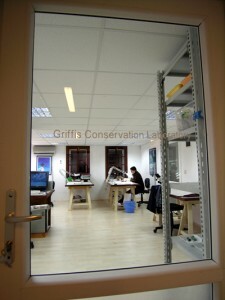 Bodrum Research Center Lab (Photo: INA).